Kingdom of Dyfed, Britain, 440AD. They came across the snared man in the hills behind Maridunum, well out of sight of the busy town. He sat on the sopping turf, his cloak pulled well over his head so the rain dripped from the edges onto the ground between his knees. One leg thrust out at an odd angle. The rain was a steady hiss against the ground and hid the sounds of their approach. They were very close when he stiffened with caution. As people did at the approach of a stranger, he reached for his belt knife. However, the knife and a good sword lay out of reach in front of him, wet and reflecting the grey clouds among the green growth. The man’s shoulders hunched over once more. He brought the cloak around him. Lynette stopped her pony with a soft word. She lifted her head so she could see beyond the edges of her hood to look at the woman on the other horse. Vivian’s dark eyes held the same far seeing, glassy expression that had been there when Vivian insisted they ride among the hills this morning, rain or not. “See if you can help him,” Vivian instructed. Lynette did not argue with the princess. When she was in one of these moods, there was no point. Just as Lynette had resigned herself to being soaked to the skin from riding out on such a miserable day, she now climbed from her horse with stoic silence. “He won’t harm you,” Vivian added, her voice louder. Her tone was firm and distant. She spoke with complete certainty. Cold fingers drifted up Lynette’s back, colder than the touch of the rain. She loosened her knife in her belt, anyway, and moved carefully across the slippery turf toward the man. She crouched down in front of him, putting herself between him and the knife and sword. Black eyes looked back at her. White, clear skin. He was young, yet had big shoulders under the heavy cloak. The cloak, Lynette noted, was made of good quality stuff. The fur lining it was thick, although it was bedraggled by water, now. “I don’t know him,” Lynette called to Vivian. “He’s not from here.” She looked at the man’s outstretched leg. Around the heavy boot was a strip of leather, cinched in tight above the ankle. It had tightened enough to squeeze and crumple the boot, collapsing it against his calf. The other end of the snare was buried beneath a rock so heavy it would require two men to move it. Local hunters used rocks to weigh down their snares in this way. They would leave the snares in place for weeks at a time, while long grass grew up around the edges of the rock, beckoning prey to nibble upon it. The man must have struggled hard to yank the snare so tightly closed. The rain made it impossible to ease open the snare. “I dropped my knife and sword when the snare tripped me,” he explained. His voice was strong and confident. “I won’t hurt you,” he added. A dim shadow cast over them, then Vivian dropped down next to Lynette and studied the man, her hand on her knife. He stared back at her, a faint surprised expression in his eyes. Lynette had seen many men stare at the princess in that way and hid her smile. Poets had written verse about Vivian’s beauty and kings and princes from far and wide had sought to marry her. Her father, Gwilym, had refused them all. As to where King Gwilym’s true loyalties lay, no one knew for sure. He paid lip service to High King Vortigern, as did everyone, yet remained vague about sending troops to aid Vortigern’s efforts against the Saxons, despite his sons railing at him to let them go and fight. Lynette had learned upon her arrival at Gwilym’s palace a year ago to step carefully around the subject of allegiances and the High King. Vivian remained unwed, offering hope to neighbouring leaders. As long her father did not pursue a match for her, there was no need for formal alliances that could not be broken later. While she was unwed, his loyalties did not have to be declared via a joining of houses through marriage. In the meantime, Vivian bewitched every man who saw her. She was a Celtic beauty, with raven black hair, eyes that matched and clear fine skin. Her brows were two sweeping arches and her chin fine and pointed. Most men, when they saw her, missed the firm line of her jaw and the furrow that was quick to appear between the elegant brows. The snared man blinked, absorbing the impact of her appearance. He waved toward his ankle. “Will you free me?” he asked Vivian. Vivian looked at the man, raising her brow. It was a reasonable explanation. Soldiers, particularly the High King’s men, were inclined to act first, only asking for explanations later. “There are king’s men on the road?” Vivian asked, her tone sharp. “I did not say they were Vortigern’s people,” the man replied, his tone matching hers. “Vivian, no,” Lynette breathed. She shifted back on the grass and picked up the knife and sword quickly, and held them beneath her cloak. They were solid, heavy things. The sword’s hilt was inlaid with a great green jewel and wrapped with gold wire. It was no simple soldier’s tool. Vivian ignored Lynette’s protest. She sawed at the leather about his ankle. Even with a sharp blade, the leather was reluctant to separate. Then, with a wet snap, it loosened and fell. Almost as if the rain had been waiting for that moment, it stopped with a suddenness that made all three of them lift their chins and look up at the sky, startled. The man laughed. There was a wary note in his chuckle. Lynette pulled Vivian away, out of the man’s reach, as he stood and shook himself off. He stamped the foot that had been trapped and wriggled the ankle, testing it. He was taller than Lynette had guessed. Lynette glanced at Vivian. The princess nodded, raising her knife to a more useful height, in case he did try to attack them, after all. Lynette lifted her hand, displaying the knife and sword. “Ah.” He took a step toward her, then his knees buckled and he sank to the ground, one hand held out to save himself. Vivian leapt toward him and pushed at his shoulders to straighten him and prop him up. “I feel…strange,” he said, his voice distant. A great shiver wracked his body. Lynette lowered the weapons as Vivian pulled the hood off the man’s head and rested her fingers against his high forehead. His hair was black and short…and wet. The fine cloak had been no protection at all through the long, rainy night. “He is far too hot,” Vivian declared. “We should take him back to the palace. The physician will be here tomorrow,” Lynette said. “No king’s men, either, I presume,” Lynette said dryly. The man shivered violently once more. It was the same flat tone Vivian had used to announce she wanted to ride, this morning. Lynette wanted to protest. They should not be helping this man. He avoided kings’ men, travelled well armed and didn’t want to be seen by ordinary folk. Helping him would entangle them in the danger that followed him. Only, Vivian had made up her mind. She was normally highly cautious of being seen as anything other than a loyal daughter. Sometimes, though, the way she had of glimpsing the future directed her to foolish and risky acts. This seemed to be one of those times. Vivian’s gaze held Lynette’s, willing her to help. Lynette didn’t quite sigh. She enjoyed a close friendship with the princess, but she was still in service to her and sworn to obey her. Vivian’s unmoving stare was a reminder of that obligation. Wow … this is a fantastic story. The author takes us straight into the heart of Arthurian Britannia with a tale that gives us the origins of the story of Merlin…Fantastically written and filled with tension. Love, love, love this book! I am amazed at how well Tracy Cooper-Posey has constructed this story to introduce us to Merlin, King Arthur’s magician, through characters surrounding his beginnings. I was absolutely surprised by how the events unfurled, and if only for that you should read it. I just can’t wait for the next one. As a long time, self proclaimed Arthurian Legend junkie I couldn’t wait to dive into Tracy Cooper Posey’s new series. Tracy once again proves to be a master story teller as she weaves the delicate threads of this beloved legend into her own. I love how the legends and historical factual ‘bits’ are interwoven in the story. Oh my goodness. Of course I was not sure what to expect with this but what I got was a wonderful story set in the time just before King Arthur. Invading Saxons, Romans, Kings, princesses, mysteries, Merlin, and romance? Wonderful beginning to a new series and I cannot wait to read more. Just loved the book – Tracy always manages to develop great story lines that keep you hooked until the end (thanks for the late night Tracy!). Can love triumph despite duty? Lynette, companion to Princess Vivian, has learned to trust the princess’ visions and so, guards the dark and powerful secret of the man in the cave. Cadfael the Black, battle commander to High King Vortigern, lives only to kill Saxons, to avenge the brutal murder of his family at their hands. At the court of King Gwilym, the very heart of Roman Britain, he meets the beautiful Lynette, a woman who could thaw his frozen heart. Fantastic start to a new series: I’m completely hooked! What an exciting start to this historical series with interesting characters and situations that are authentic to the challenges for men and women of these times!! I loved the setting of this story and the succinct writing style which carried me through what I had thought would be a weighty novel. I have no particular interest in the historical characters of myth and legend who are woven into this story but I loved that the story was told from personal viewpoints and kept interesting by its fast-moving action and intrigue. 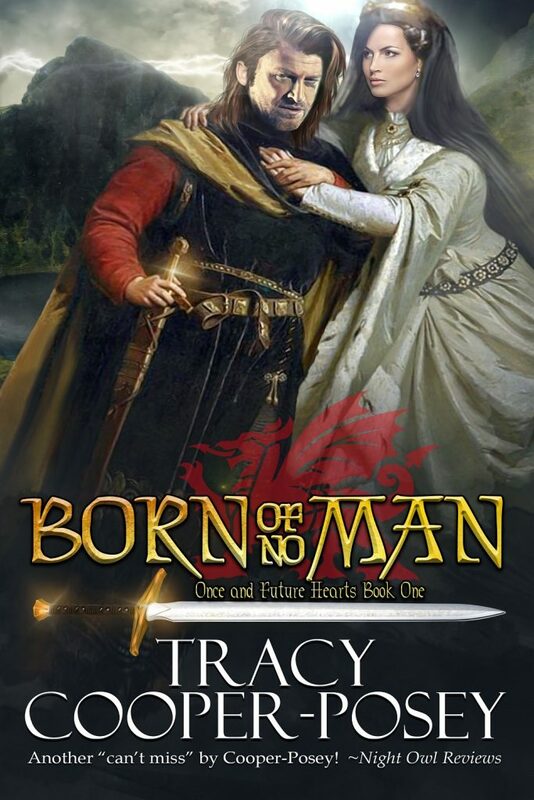 Tracy Cooper-Posey tells a rich and complex story with hints of political intrigue and interesting characters who are very much a product of their time. What I really appreciate about Cooper-Posey’s writing is that while the story and characters are complex I never got bored by expansive historical facts and background, it was all relevant, brief and interesting. I had meant to just read the first chapter but hours later, in the early hours of the morning no less, I found that I had demolished the whole book!! I’m looking forward to reading the rest of the series and I now know not to start one of these books too late at night!! Engaging Trip to a Difficult and Early Time!!! Captivating story of early times where alliances and battles are the rule. Where women are second-class citizens, not taught to read or write, yet may hold power by the fact they go unnoticed. The focus of our story is Lynette, companion to Princess Vivian who has the “sight” to predict future events. When Vivian insists on assisting a bedraggled man at her own peril, Lynette is loyal and follows her mistress. When warrior Cadfael the Black become suspicious of their activities Lynette must distract him. Her study of the man shows her to earn his trust by being straightforward rather than attempting seduction. The sights and sounds of medieval times come alive in this compelling read!! Loved this book!! It is a great start of a new series. The characters meshed so well together and the story line just hooked me from the start. I can't wait for the next book and to delve deeper into this great story. Great book! This is a new storyline with the same great Tracy Cooper-Posey feel. It flows nicely and has great characters and interesting settings. I love how the legends and historical factual ‘bits’ are interwoven in the story. I am really looking forward to the rest of the series. As soon as Emrys was mentioned I was hooked. Chapter 7 was a shocker, but I've learned with all of Tracy's books a shock can come out of nowhere & make the story. This was a learning curve on top of the history I already knew. Cadfael a soldier who lost a lot, was about to try again, with the trust & love of Lynette. Love & trust won through in this brilliant historical read which had its historical values too.